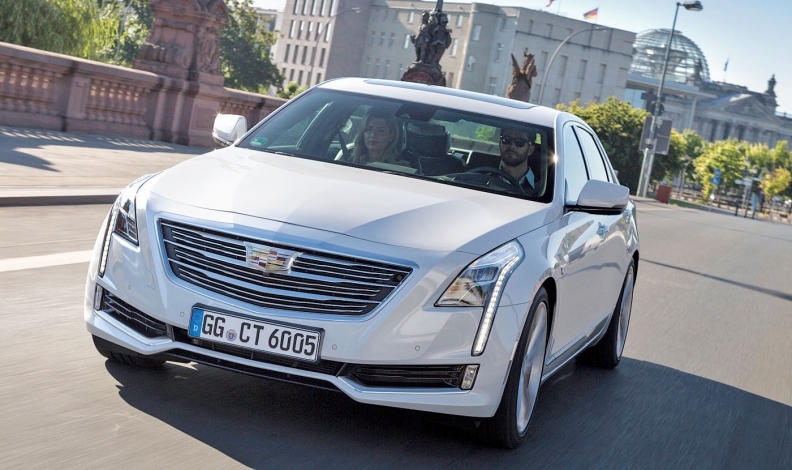 The CT6 is among Cadillac's offerings in Europe, where the brand has lagged rivals. As General Motors bids goodbye to its Opel/Vauxhall operations, the automaker has confirmed it will remain in the European premium market with Chevy performance cars and Cadillac. Why not? Cadillac's European operations are separate from Opel, and given their size, there's little downside to sticking around. The vehicles for sale have higher profit margins and help the reputations of both brands. It's a long-term play to defend Cadillac's and Chevy's statuses -- to an extent -- as global brands. "Having some presence is better than having no presence at all," said IHS Automotive senior analyst Stephanie Brinley. "It doesn't have to be high-volume. It has to be profitable." Cadillac has spent a decade trying to gain traction in Europe against BMW, Mercedes-Benz and Audi. The three German juggernauts account for roughly 85 percent of the region's premium market. Each sold between 820,000 and 840,000 vehicles in the region in 2016, according to the European Automobile Manufacturers Association. Cadillac's 45 dealerships in Europe -- mostly in Germany and Switzerland -- sold just 781 vehicles last year, up 33 percent from 2015, according to GM. Add in the Chevrolet Camaro and Corvette, which are sold alongside Cadillac in many dealerships, and sales remain lower than many niche exotic brands that sell cars for millions of dollars apiece. "I don't know the benefits of keeping Cadillac there," said Rebecca Lindland, senior analyst for Kelley Blue Book. "Anytime brands like Bentley or Ferrari outsell you, that's not a positive." Bentley sold 2,676 vehicles in Europe in 2016; Ferrari sold 3,610. She added: "I can better understand keeping Corvette and Camaro -- those types of American cars -- more than Cadillac." Indeed, the success of Ford's Mustang in Europe suggests there's still a viable market for out-of-the-mainstream American sports cars with some heritage. Ford sold 15,300 Mustangs in Europe in 2016, a 44 percent increase from the previous year. GM said it sold just more than 1,800 Corvette and Camaro cars in Europe last year. Between the Cadillac and Chevrolet models, GM wants to reach 5,000 annual sales in Europe by the end of the decade, which would remain a tiny sliver of the overcrowded, 15 million-plus-vehicle European market. "It's a big mountain to climb," Brinley said. "That's the reality of it." 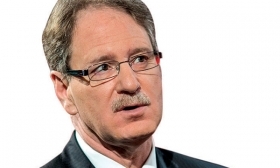 De Nysschen: Pushed back Cadillac expansion plans in Europe. Johan de Nysschen seemed bullish on Cadillac's expansion into Europe when he took over as brand president in summer 2014. But a year into his tenure, he said the company was pushing back those plans to "beyond 2020." The move is part of Cadillac's long-term attempt to become a larger player in the global premium market. It continues to grow in China and many developing markets, including the Middle East. The U.S. and China are Cadillac's "volume hubs" while it eyes "disciplined growth in Europe," according to the company. "Cadillac global growth plan continues, and is making progress," Cadillac said in an emailed statement to Automotive News. "Realistically, we see our brand as playing more of a boutique role in Europe -- an alternative to the traditional luxury establishment." Cadillac is continuing with plans "to considerably increase" its dealership network "over the next few years," spokesman Andrew Lipman said. In Europe, Cadillac sells the ATS compact sedan and coupe; CTS midsize sedan; CT6 full-size sedan; XT5 midsize crossover; and Escalade full-size SUV. The ATS-V and CTS-V high-performance versions also are available. GM's plans to remain in Europe with the Chevrolet sporty cars and Cadillac are similar to its plans for Russia, which included focusing on the premium market with Cadillac. In Russia, the brand sells the CTS/CTS-V, XT5 and Escalade/Escalade ESV.